Shoutouts to Knit 1 Geek 2 Podcast and The Hollywood Knitter Podcast for playing our promo. Jen traveled and it was too hot to knit. She also got some new yarn from the Unique Sheep Gourmet Club and Cookie A’s Sock Club. The patterns in this month’s Cookie A Club are inspired by Star Trek, one of the cookie recipes is reminiscent of Doctor Who, and the yarn is from Sweet Georgia. Laura had family visiting. She also worked on prepping for our World Wide Knit in Public Day Event. She has also been dying a lot because her yarn is in a new shop, KnitKabob, in Union Oregon. The newest Mean Girls Yarn Club shipment went out. 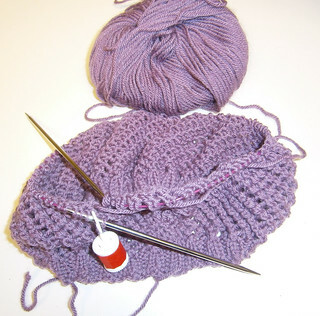 Laura is working on the Lacy Cap by Carissa Browning in Rowan Cashsoft 4-ply in a lavender colorway for someone with trichotillomania. Jen started her Camp Loopy Project. She’s knitting the Tiong Bahru out of Fleece Artist Saldanha Two yarn. She continues to work on her Madroña Shawl. This is a very serious scarf. Laura finished a Yarn Over Cross Scarf for Interval House in Brown Sheep Company Lanaloft Worsted. A finished shawl! In spite of procrastination. Jen finished her scarf for Interval House as well. 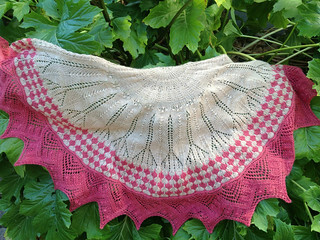 She also finished her Romi Hill Mysterious Shawl Knit-a-long. Jen mentions the Knitmore Girls. Laura is struggling with her Nerd Wars projects. She is struggling with time to work on stuff. Creative planning is why this isn’t yet done. She also is intentionally not knitting on a Jayne Hat Hat of Controversy so she can use it in WIP challenge. Jen still isn’t working on her baby sweater. Jen had problems counting while working on her Tiong Bahru. Laura is struggling with her Sabre Project so she’s changed her dissertation project. She’s now working on six bears for the Mother Bear Project (something that Dr. Gemma talks a lot about on CogKNITive). 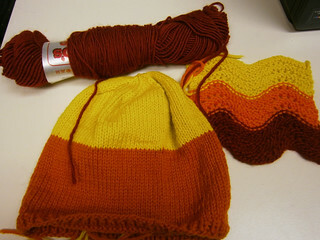 They will be Firefly themed, to go with the “Jayne Cubb” she made for last year’s CogKNITive Fiber Retreat KAL. Jen is going to make a Tempest Cardigan for her July Camp Loopy Project out of Dream in Color Smooshy. She also wants to work on a giant afghan using all the squares from the Great American Afghan, Great North American Afghan, and Great American Aran Afghan books. She’ll be knitting it out of Cascade 220. We answer a question about summer knitting projects from Spiritsmith. Both like socks because they are small and portable and not too hot. Laura mentions the Lady Clementine Socks. Laura also likes hats such as the Nine Dwindling Cables Beret. Jen likes lace because it’s not too heavy. She mentions designers Caitlin ffrench and the Mizzle Shawl. For crochet, Laura likes tawashis. They also recommend some more difficult designers for people who are off school or work and have time for something complicated: Sivia Harding, Romi Hill, Steven West, and Jared Flood. We talk about our WWKIP event and play some interviews. We loved meeting everyone and were so glad you all came. Thank you to everyone who brought scarves for Interval House. We hold our prize drawing and the winner is Cre8vleigh! She wins a skein of Dizzy Blonde Yarn! Speaking of prizes, we will do a prize drawing for members of our Ravelry group, once the group reaches 100 members. There is a tutorial for making your own lightsaber knitting needles. Jen is fascinated by Black Pearl yarn. We talk about Warehouse 13 and Falling Skies. We also mention the shows Buffy the Vampire Slayer, Rome, Dexter, ER, and Lost. Jen mentions the Craftlit Podcast. You can come back at 1:04:05 if you don’t want to be spoiled for Falling Skies. Mean Girls Yarn Club signups will open soon! Check the webpage for details. KnitDizzney will be Sunday, September 8th, 2013 at Disneyland. More details to come, but we’d love to spend a day at the Disneyland park with you! We will have t-shirts for preorder and possibly a custom yarn color! Thanks to everyone who has left us a review or rating iTunes! 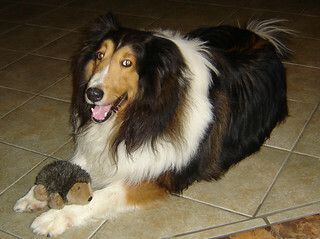 Laura lost her dog Sabre. She is trying to keep busy, but it’s been really hard. Jen’s Stitch and Beach Group had a yarn swap. She got some different novelty yarn to play with (it will probably become charity scarves for Interval House). She also got some pretty purple laceweight yarn. Laura mentions the Cogknitive Fiber Retreat yarn swap. We talk about how useful yarn swaps are, both to give yarns you may not use a good home with people who really love them and to get yarns that you aren’t used to working with (different colors and fibers) to break out of your comfort zone. We both both bought things out of our comfort zones on the Yarn Crawl. Jen cast on the Mysterious Shawl Knit-a-long by Romi Hill out of A Verb for Keeping Warm Floating in the colors Au Lait and Transnational Fury. Laura is still working on her Clapotis (or, as she calls it, her Sassy-tis, because the yarn was dyed to match her cat, Sassy). Laura is also working on a beaded choker design and trying to chart it and make the directions make sense and make it the correct size. Progress was a little sidelined by Sabre’s passing, but now the pattern is off to the test knitter. Jen also worked on an easy scarf out of Lion Brand Homespun while watching the new Star Trek movie. She named the scarf “Chekov put on a Red Shirt” because she thinks Chekov is adorable. 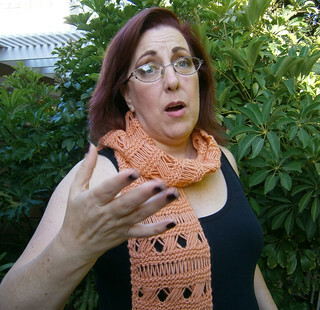 Jen mentions her knitting guilds: the El Segundo Slipt Stitchers and the Chocolate Martini Lace Knitters Guild. We mention designers Marnie Maclean and Janine le Cras, who does the patterns for the Unique Sheep. We digress about Chekov and Sulu in the original series and the animated series of Star Trek. Jen has had to rip back some of the bind off in the center section of her Madroña shawl because it was too tight. (Jen has issues with tight bind-offs and crocheting too tightly). Laura recommends wine to relax. Jen is hoping that beer and a marathon of Vikings with her friend will do the trick. 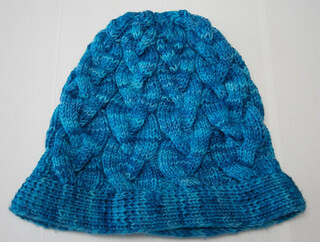 Laura tried to substitute yarn on the Nine Dwindling Cables Beret by Yarn Owl. But math was not her friend. She’s going to rip and re-knit a modified version. 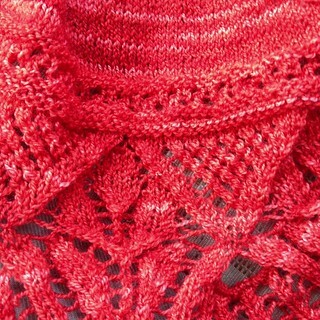 Jen is going to do a lace shawl for Camp Loopy out of Fleece Artist Saldanha Two in Vermillion color. She hasn’t yet picked a project. She thinks the red color is wrong for Rock Island, so she will probably knit a pattern by BooKnits or the Romi Hill pattern Fire Bird (which she mistakenly calls “Firebrand”). Laura is going to handpaint some yarn to match Sabre and work on a scarf and fingerless mitts for her husband. This is her dissertation for Nerd Wars. We review 50 Sunlowers to Knit, Crochet, and Felt by Kristin Nicholas. (Full disclosure: Laura won this book in a contest from Vogue Knitting). We give spoiler-free reviews of both Iron Man 3 and Star Trek: Into Darkness. Jen talks a bit about the season finale of Doctor Who and the companions (no spoilers!). We digress into less geeky shows. Laura talks about the season ends of Grey’s Anatomy, Castle, and Scandal. (All spoiler-free). We also discuss How I Met Your Mother. And then we get into the Big Bang Theory and being a geek. Also, we wish Tim Curry (star of Clue, Rocky Horror Picture Show, and Oscar) a speedy recovery! We also mention the films Hedwig and the Angry Inch and Singin’ in the Rain. 4. A scarf for Interval House. Details: The scarf can be any yarn, any weight and may be knit, crochet, or woven. (Great for stash-busting if you want to do stripes!). The only guideline is that it be at least 4” wide and 60” long. A more open work scarf is preferred (i.e. not a heavy dense fabric) as this is for women in Southern California, but really, that can just mean using really big needles. I tend to do mine either in garter stitch or a simple rib or broken rib on big needles. Please bring the scarf in a ziplock or some other bag (the bag does not have to seal) with a paper saying your name, the yarn the scarf is made of (if you know it, if you don’t that’s okay), and any care instructions. Also please provide contact info (email and/or phone number). The contact info is just for us to get in touch with you if you win the drawing; we will not sell, trade, lend, borrow, fold, spindle, or mutilate your contact info and it will not be provided to my guild or to Interval House, I promise you. Multiple scarves = multiple entries in the drawing!